Jones was born in New York City and grew up in Boca Raton, Florida. Her parents were both Shakespearean actors. She dropped out of high school to perform in a local play, then moved to New York City to pursue acting at 19. In the early 1990s, she was in the touring company of Grand Hotel, as well as other national and international tours, performing Rent in German and Evita in Spanish. She performed in the 2009 Broadway revival of Hair as the replacement for Mother, Buddahdalirama, and Member Of The Tribe. She was one of the original cast members starring in the revival of Pippin, playing Catherine, Pippin's lover, during the entire run. 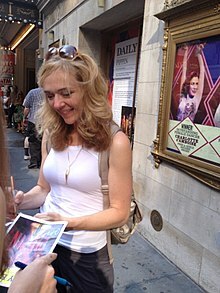 Jones portrayed Evan's mother Heidi in the musical Dear Evan Hansen, which premiered at the Arena Stage in Washington, D.C. in July 2015. She reprised the role in the Off-Broadway production at the Second Stage Theatre in May 2016, and then on Broadway starting in November 2016. At the 71st Tony Awards, she won for Best Featured Actress in a Musical for her portrayal of Heidi Hansen. After leaving Dear Evan Hansen on August 5, 2018, Jones performed at several small venues in Something Beautiful, a one-woman cabaret show that draws music from her expansive career and bringing meaning from her life into the lyrics. She is expected to star in Next to Normal at the Kennedy Center in the Center's January through February 2020 Broadway Center Stage series. She has a daughter, Miranda, and is partner to actor Benim Foster. Jones has one sibling, her brother Darren. ^ a b c d e "Tony Awards: Rachel Bay Jones' 'Dear Evan Hansen' Nomination Caps Three-Decade Quest". The Hollywood Reporter. Retrieved May 26, 2017. ^ "Pasek and Paul's Dear Evan Hansen, About the High School Struggle to Fit In, Premieres in D.C. - Playbill". Playbill. Retrieved July 12, 2017. ^ "Tickets Go on Sale Today for Broadway's Dear Evan Hansen - Playbill". Playbill. Retrieved July 12, 2017. ^ "Dear Evan Hansen Opens on Broadway December 4 - Playbill". Playbill. Retrieved July 12, 2017. ^ "Good for You! Dear Evan Hansen's Rachel Bay Jones Wins Her First Tony Award". Retrieved November 29, 2018. ^ "Drama Desk Awards Name Shuffle Along Best Musical - Playbill". Playbill. Retrieved July 12, 2017. ^ "Ben Platt, Sutton Foster, and Josh Groban Among 2017 Drama League Award Nominees - Playbill". Playbill. Retrieved July 12, 2017. ^ Desk, BWW News. "OSLO Big Winner at the 2017 Lucille Lortel Awards, Full List!". broadwayworld.com. Retrieved July 12, 2017.